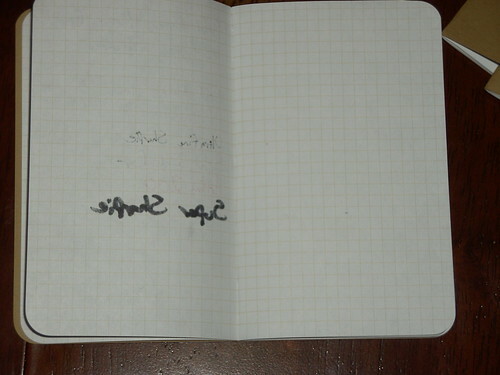 Here is another review of a notebook which was graciously sent as a sample. 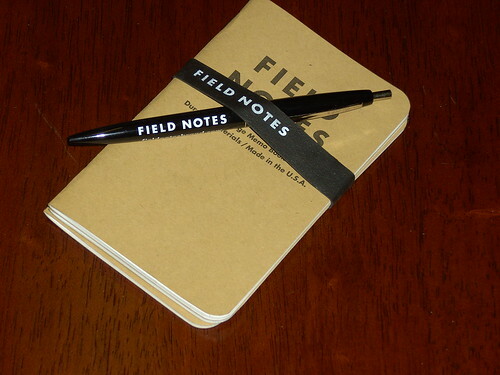 Thanks bunched to the Field Notes crew! I have been a bit of a pessimist when it came to “pocket” notebooks. Don’t get me wrong, I love the idea of having pen and paper at hand when you need it, and I use pockets every single day (phone, keys, wallet… who doesn’t?) but when I have checked out “Pocket” sized Moleskine’s, or A6 pads, they are just too big. Add a pen to that, and unless you have magic pockets, it’s just annoying. 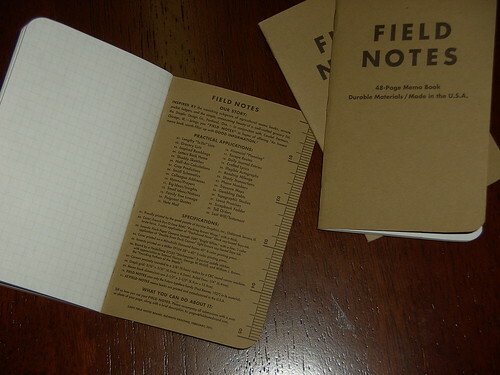 Enter Field Notes memo books. Weighing in at 3.5″ (89mm) x 5.5″ (140mm), and having only 48 writable pages (12 sheets, stapled in half, writing on both sides) they seriously are “pocket”-sized. Actual pockets. 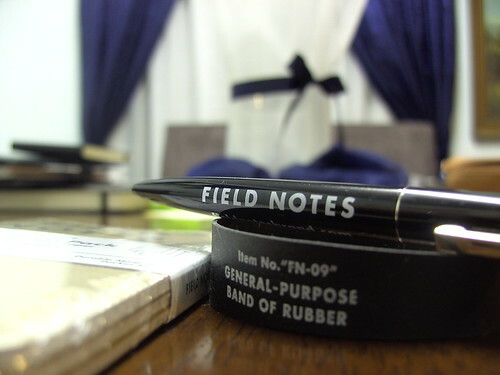 Along with the mixed pack, they also threw in a “general-purpose band of rubber” and a Field Notes click pen. The band is definitely general-purpose, and is a decent size. I personally wouldn’t use it, as most of the pens I like have a good firm clip, but for stacking notebooks in bags, it’d be excellent. 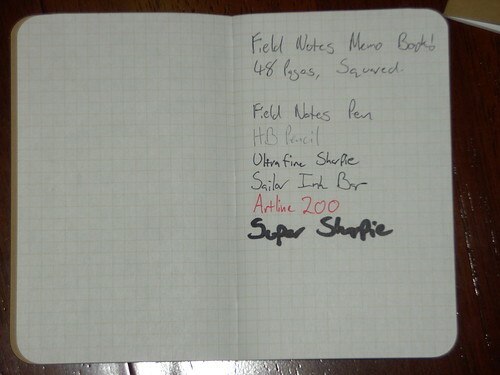 I have chosen to review the squared version, as I have not personally used a squared notebook before. As you can see, there is quite a bit of information printed in the covers. On the front, there is a “Property Of” sections, “Pertinent Coordinates”, Start and end date sections, and a contact email address in case of loss. 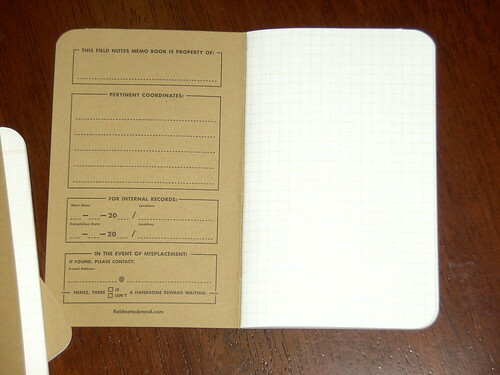 In the back cover, there is a quick “Field Notes” story, a list of 30 possible uses for the notebooks, all the specifications used in the production of the notebooks, and a ruler along the side. The paper is nice and smooth, and writes well. It feels about 80gsm, and deals with bleed and show-through fairly well. I have been carrying a single notebook (the squared one) and one of my favourite Pilot V5 pens in my pocket ever since I opened the package, and it has come in handy more than once. It has also inspired me to start sketching, which is something I hope I continue. The cover is made of a fairly sturdy “card”, and survives pocket travel quite well. I have noticed some scuffs in it where my pen has been clipped, but doesn’t that just add to the romanticism of old notebooks? You pull them out from a draw in years to come, and imagine what each scratch, tear and nick was caused by. These notebooks are great, and when I finish the mixed pack, I will definitely grab another 3 of my preferred kind. 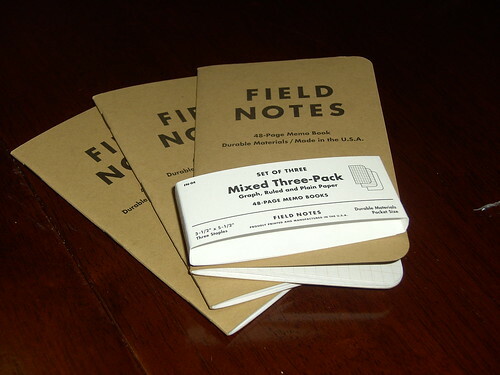 Speaking of, you can purchase these from a number of places, such as the Field Notes Online Store, Notemaker, and I even found a place in Brisbane called The Outpost. Generally, a 3-pack would set you back about $10-12, but it will vary. 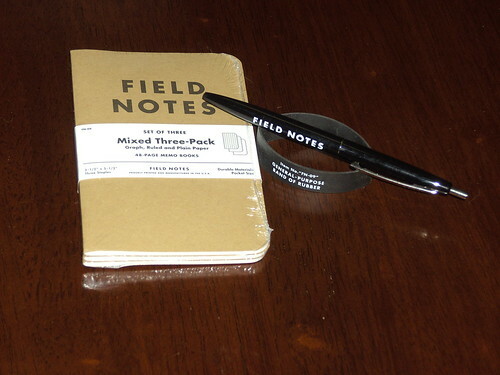 So I have told you what I do with mine, but here is the question… What do you do with your Field Notes? Why not be a little proactive and Answer in the comments! Share the love of Stationery! Nice review! It’s great news that they’re available in your part of the world, too. They’re still not that easy to find in person in the States, but it’s getting better. Thanks for the compliment Yeah, I’m pretty keen to go for a walk and visit the store which sells them, but I’d be likely to buy some special editions, and unfortunately I don’t have the cash at the moment. I have been carrying the grid 3×5 moleskines with a staple reinforced back flap for 3.5 and business cards, a few post-its inside the front cover and a little notch in the front cover to anchor a pen. It’s a mini briefcase. I would love to see that in action. Is it a hard or soft cover? Do you have any pictures? The opinions and views of StationeryReview.com are solely those of the author of the review, and should not reflect on brands or companies mentioned on the site.